"Such decisions are not adopted without dialogue with people." 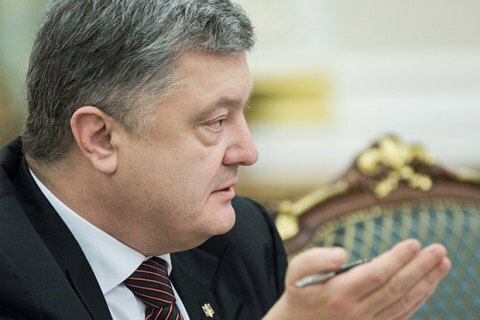 President Petro Poroshenko believes that the decision of the National Commission on the Regulation of Energy and Utility Services (NCREUS) on the introduction of subscription fee for household utility gas should be suspended " Such decisions are not adopted without dialogue with people," Poroshenko said on Monday as quoted by his press service. "This resolution should be suspended! I call on the government and the NCREUS to find an agreed solution that would provide for non-raising of tariffs and extending subsidies on all types of payments for all who need it," the president said. The price of utility gas was planned to be divided into two components: the price of gas as a commodity (4,942 hryvnya/thousand cubic meters plus the marginal trade margin of the gas distributing company of 3.2%) and a subscription fee for the connection to gas grid. The regulator sets the fee on the basis of the connected capacity of each consumer (eg a gas meter). The tariff covers the costs of Ukrtransgaz for transportation of gas via main gas mains to gas distribution systems (about 23% in the tariff structure). The regulator has said the subscription fee will be about 92 hryvnia per month for the most popular types of gas meters. Currently, the final price for utility gas is set at 6,879 hryvnia/thousand cubic meters, including all transport costs, taxes and retail margins. Social Policy Minister Andriy Reva has said the introduction of fee will not increase the gas bills, but Prime Minister Volodymyr Groysman said that the rise in price will be quite tangible.